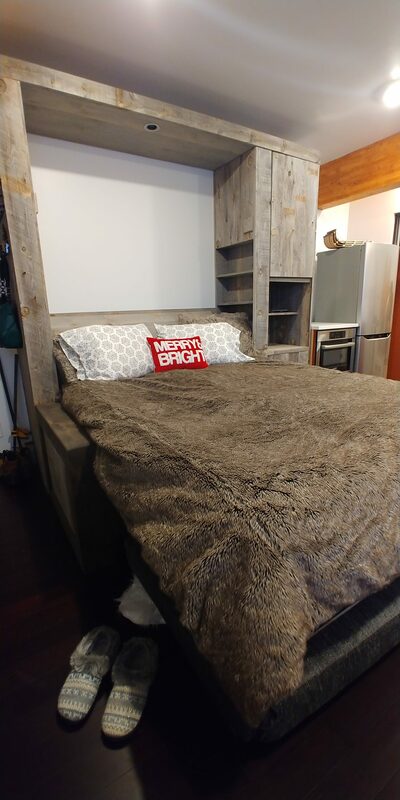 We took some of that snow fence you see in Wyoming along Highway I-80 and brought it back to Denver to make a reclaimed wood murphy bed. Then we added a little whitewash, fitted in a SICO Eurobed Queen system, and dressed it up with tables, hidden nightstands, closets and drawers. A light system from HERA made for perfect reading in bed with a 6-bulb LED swivel light-fixture recessed into bridge assembly. Electric outlets added for convenience. 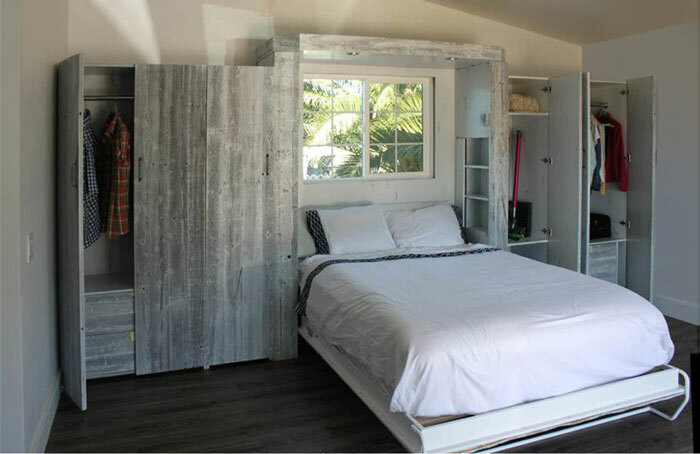 This reclaimed wood murphy bed was outfitted with a 16” thick mattress. As if it needed it, the wood-slat foundation built into the SICO metal frame guaranteed the same sleep comfort as in the master bedroom. I wish we could say we put in that great view out the window, but the Bauter family has total credit for that great design touch and gorgeous use of a reclaimed wood murphy bed. 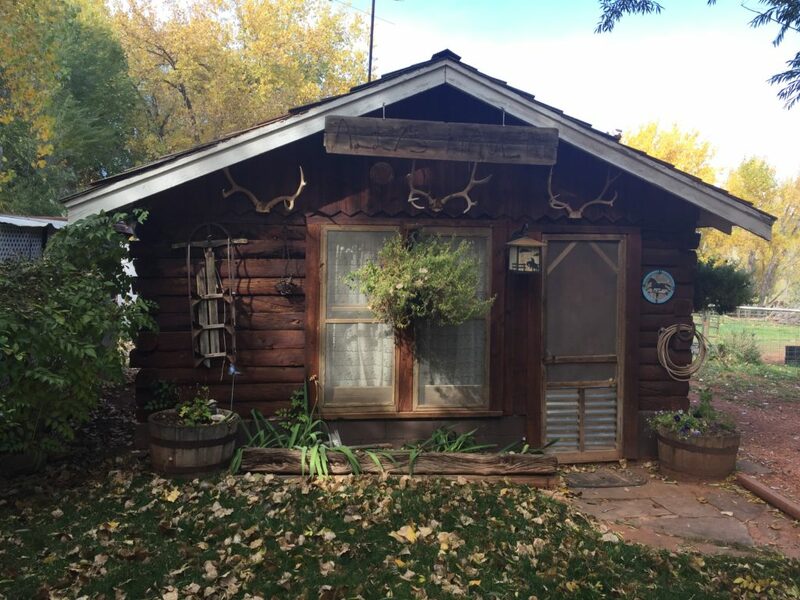 Robin used the cabin on her horse ranch in Loveland, Colorado as an office to sign contracts for boarding horses. It would also be perfect for occasional guests to stay overnight, but was too small to fit a bed and a desk. 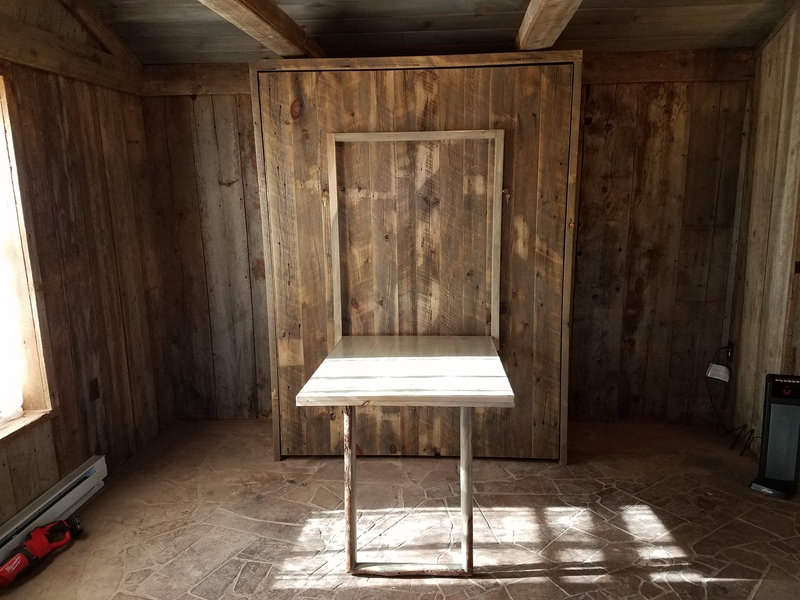 She contacted us to build a wall bed with a folding table on the front to make the cabin truly dual purpose. 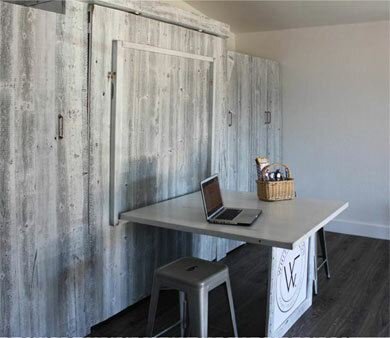 Her quaint little cabin became both a casual office and cozy bedroom with a hidden 13″ thick mattress. 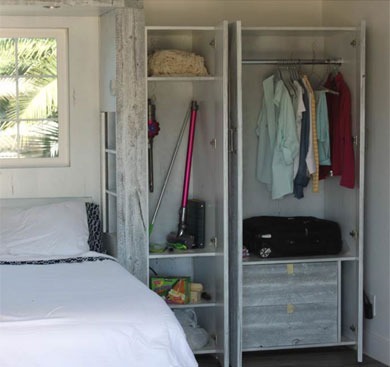 The SICO Eurobed murphy bed mechanism was selected to meet Robin’s needs. It is more compact and has a strong metal frame that supports a flexible wooden slat foundation for the mattress. The lowered mattress is at a comfortable 24″ height. 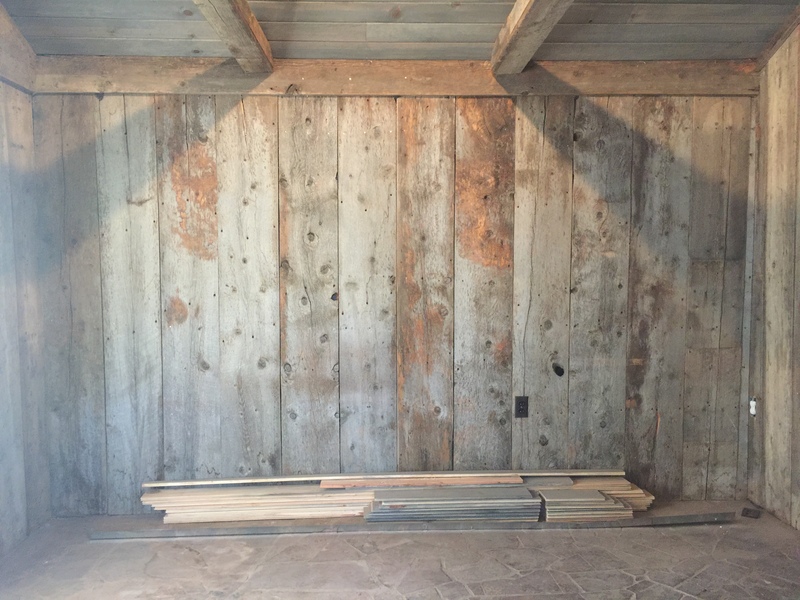 There was a barn wood wall where Robin wanted to put a queen murphy bed. 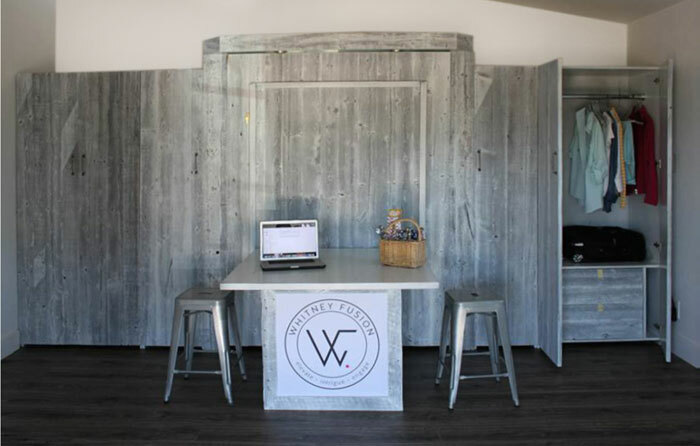 Our reclaimed Wyoming Snow Fence was the perfect wood to complement the room. 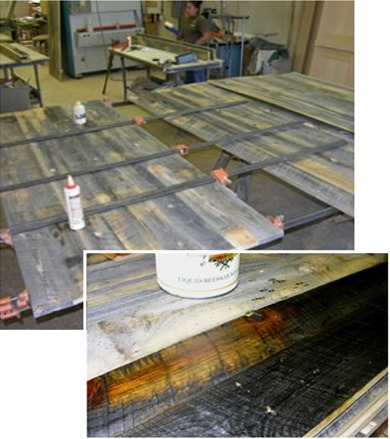 The raw boards were ‘skip planed’ and finished with a clear pre-catalyzed lacquer. 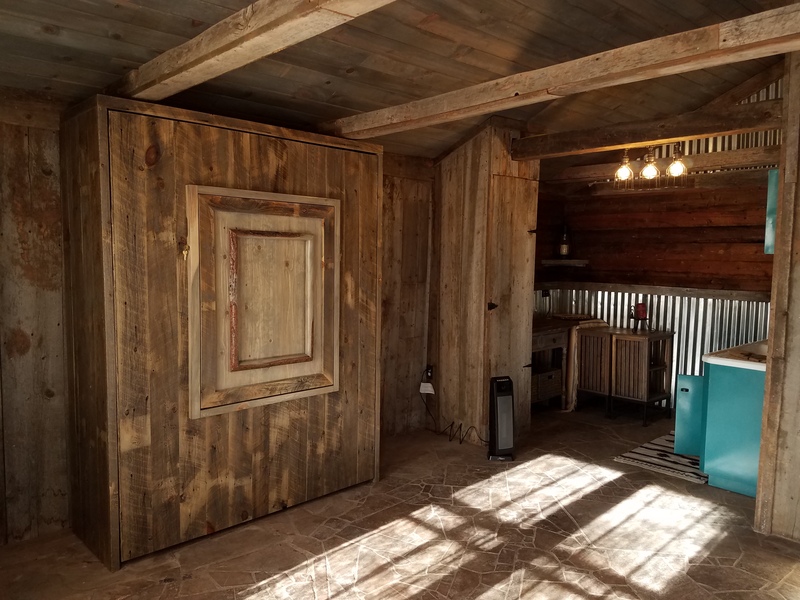 Love this rustic look? 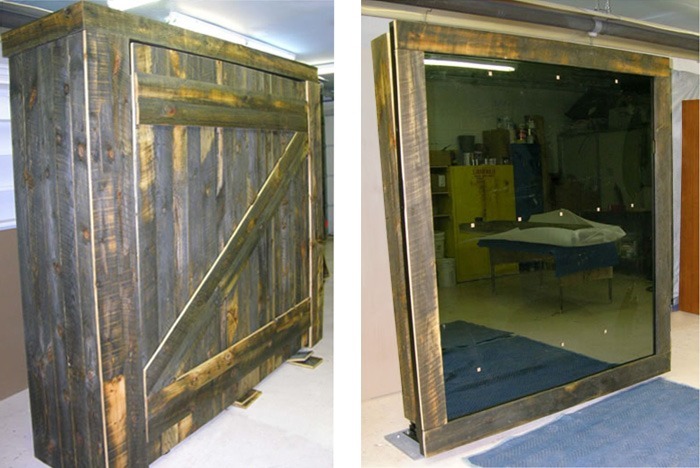 Check out a variation we call our Barn Door Murphy Beds. 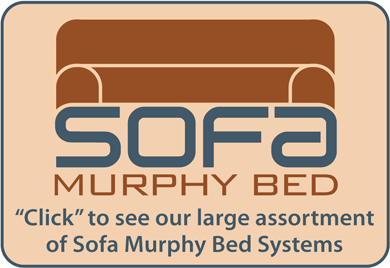 Or check out more examples of our Table Murphy Beds. There is a nice ski resort close to Seattle that we shipped this unique sofa/bed system to in 2018. 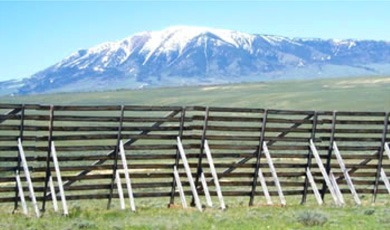 It is a combination of woods: Wyoming Snow Fence and Rustic Alder from Oregon. 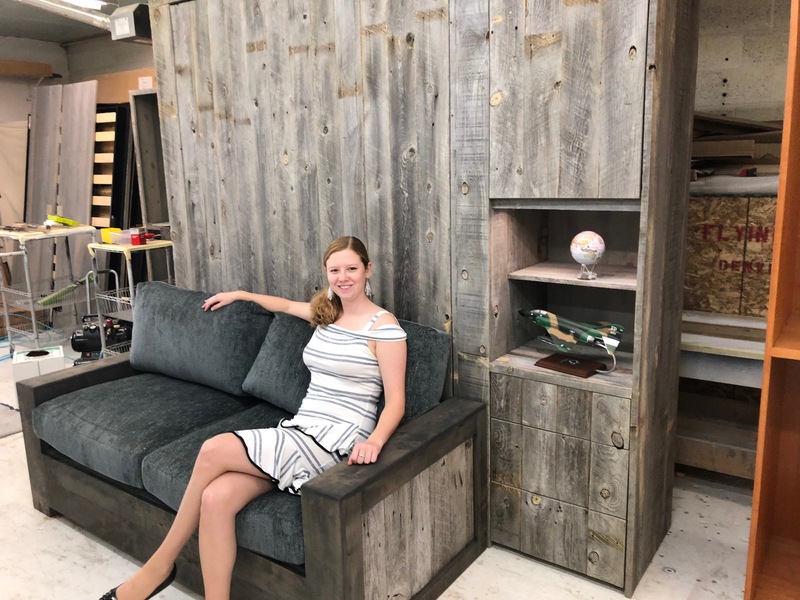 The room was small, and making a dual purpose bed was a perfect choice for our Murphy Bed that became a comfortable sofa with plush, down-filled cushions. The same ‘footprint’ in the room serves two purposes, making the space more valuable. With the bed lowered, a nightstand function is assigned to each side of storage area. LED lights and sloped headboard adds convenience to the lowered 13” thick mattress. Free design assistance and quotes on manufacture cost for your room. This is a story of a Wyoming snow fence going to New York City. 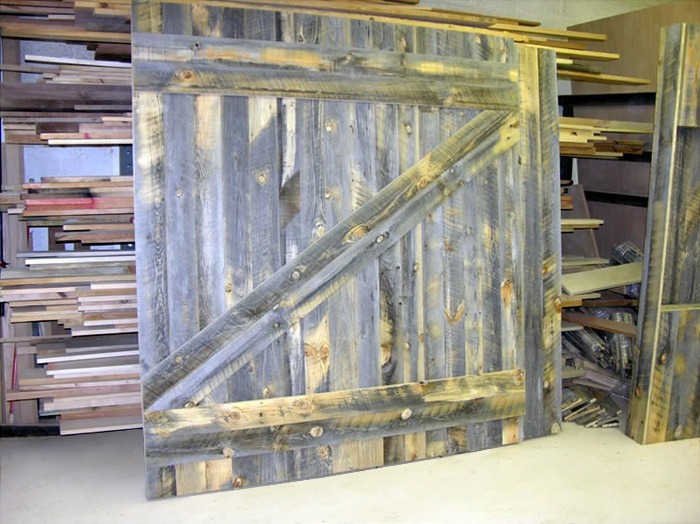 Kevin and Jennifer called and asked if we could make a Barn Door reclaimed wood murphy bed. 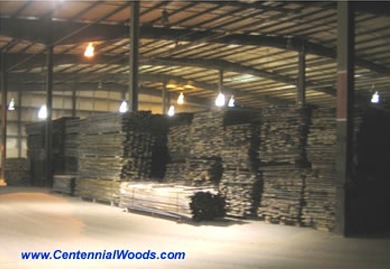 I suggested they visit www.CentennialWoods.com and tell me what they think of Tommy’s reclaimed lumber. They called the next day asking for samples to be sent, and selected what is called a 20% skipped finish on the individual boards. Their next request was to find an eco-friendly finish. I sent them to www.Skidmores.com as I had heard good things about this Beeswax finish. We sent down samples, they selected proof. 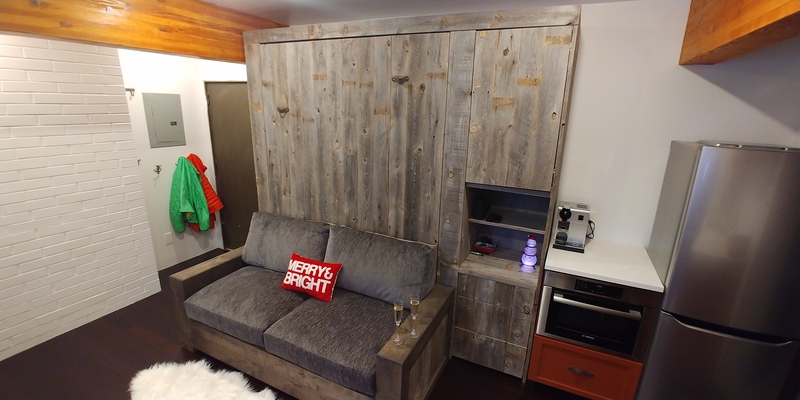 The photos to the right demonstrate that unique reclaimed wood murphy bed application. Wyoming has a lot of snow fence at the continental divide. The wood has to be replaced every 7 years by contract. The 16 ft long planks of pine have lots of nails in them. This reclaimed wood has its own character. It’s wild! 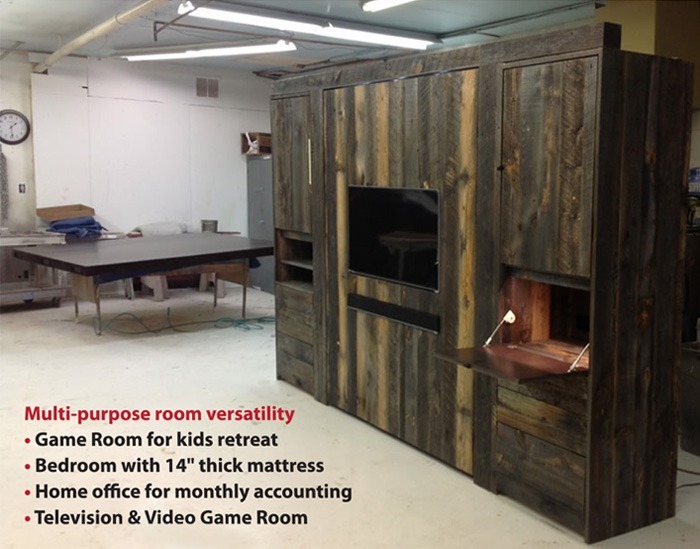 Both these King size reclaimed wood murphy bed varieties went to an apartment in New York City! 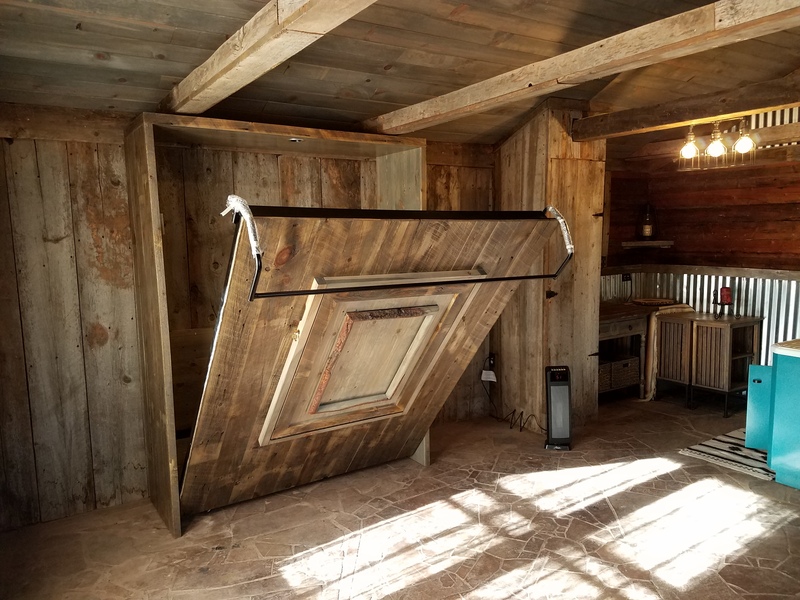 The original design of the swinging barn door was so appreciated, a second King Murphy bed was awarded us that asked for a mirrored bedface. Instead of doing our normal crystal clear mirror, we applied a gray tinted 1/4″ thick mirror. 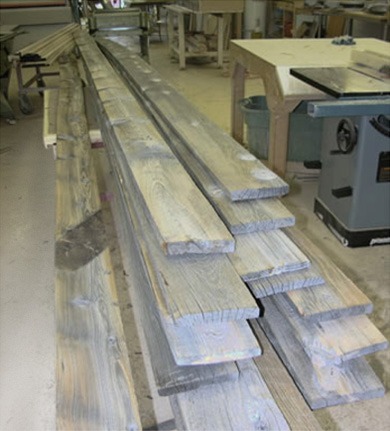 The raw stock for the reclaimed wood murphy bed came in 16-foot lengths. 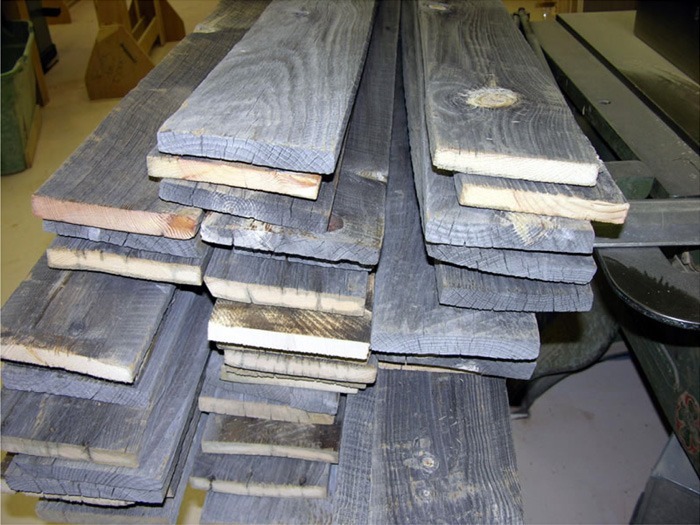 We started by straightlining the weathered irregular edges to create consistently straight boards. The next step is gluing and clamping to create workable solid panels. Below, we see a test application of Skidmore’s Beeswax eco-friendly finish to preserve the natural beauty. Mike is pleased that the bed is holding all positions and floating to the floor with minimal effort. Lifting this bed was a two-finger operation. I challenge any other manufacturer to match this controlled lift and lowering. We have a page on this site devoted to the explanation of how the SICO Room Maker works. 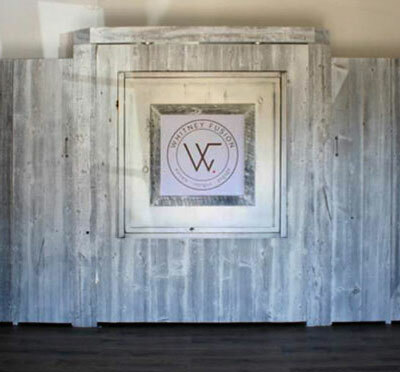 We like to think that this reclaimed wood murphy bed model was dressed up and ready to go to the dance. Features included are two file cabinet drawers, valance lighting hidden in desk module. Lowered bed has sloped headboard and full back panel. Our standard drawer operation is BLUM full extension, soft-close, bottom-mounted glides supporting solid maple dove-tailed drawer boxes. Samsung Smart Television is married to sound bar directly below, facing the game player. Realism to the max! Lighting for lowered bed is Hera LED light systems from Germany. Includes electric outlet and USB-connectors for phone charging. This is a prime example of the home owner designing a system specifically for a multi-purpose room. Let’s design one for you! SICO Roommaker can lift more weight than any other Murphy Bed manufacturer that I know of! 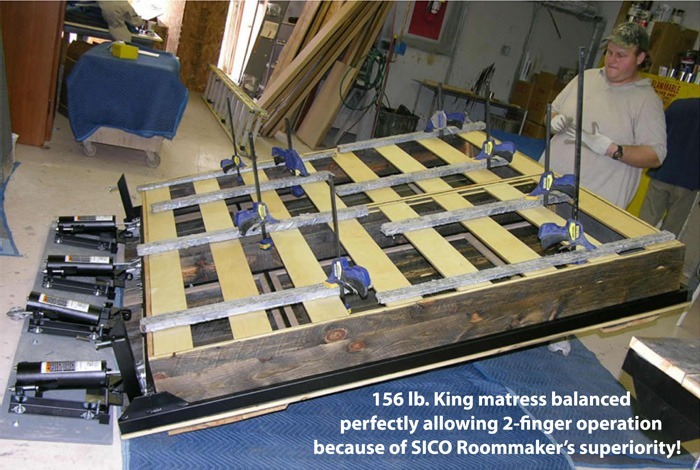 The trick to balancing the SICO Roommaker to float and hold positions is to have the weight of mattress and bedface already on bed. This was not possible for the NYC order because the latex mattress manufactured in California didn’t stop in Denver on it’s way to New York. So I called the California manufacture and asked, “How much did that king mattress weigh?” A hefty 156 pounds! That’s a two-man lift of the mattress only. What we are showing in this picture is lead weights clamped to the custom-made foundation that equaled 156 pounds.